The fact that Crete can surprise you have had the opportunity to see many times. Another proof for this claim is in the village of Potamida. On the edge of this settlement grows a complex of clay mounds called Komolithi (Komolithoi). These earth pyramids, referred to as the Greek Cappadocia, form one of the strangest and most interesting landscapes in Crete. We found information on the pyramids in the village of Potamida on the internet in 2009, when we were preparing for our next trip to Crete. We quickly joined this place to one of the routes we intended to cross. Needless to say, we have obviously achieved this goal. After this trip about the Potamid, we mentioned in our second subjective guide. We decided, however, that this place should also be included in our map of attractions in Crete. 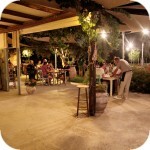 The more so because we have not found any mention of it in any Crete guide we know about. 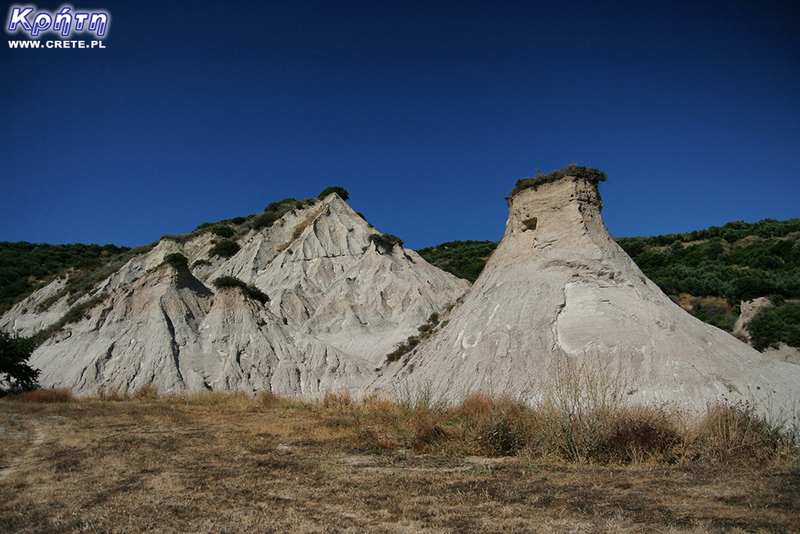 The information about the pyramids in Potamida came from several Greek publications and the portal https://www.geocaching.com/play . The small and not very large village of Potamida is located in the Kissamos district about 35 km west of Chania. Only a few kilometers separate it from the spectacular Gorge Topolia. To get to Komolithi, you have to cross the Potamida towards the north, turn right and continue heading north. After driving a few hundred meters, you should already notice the pyramids, which are visible on the right. When you get to the fork of roads, turn right to the side road and later you just need to look for entry to the dirt road, which you will reach to the foot of this geological phenomenon. If you are there in the summer, you can safely climb the less steep cones that are dry during this period. In spring and autumn, attempting to approach them means wading the ankles in a waterlogged clay. The pyramid slopes are mostly barren and only the upper part is covered with vegetation. They are almost completely made of clay. Years of erosion caused by water and wind formed this material in such unusual shapes. Researchers from the University of Crete, who recently took a closer look at this place, also found traces of pyrite called "gold of fools" and gold. However, research into the pyramids by the Dutch in the 1970s shed more light on the mysterious pyramids. They were an attempt to determine the time of creation of these geological formations and to explain the presence of marine fossils in them, including the remains of 15-meter sharks from 7 million years ago. To understand the genesis of this geological phenomenon, it is necessary to go back 10 million years. In Miocene (the oldest epoch of the neogen), when the Mediterranean Sea was formed, Crete was part of the archipelago. Its eastern part rose above the water, while the western one, in which Komolothoi are located, was under water. This explains the presence of marine fossils and the type of geological material from which the pyramids are built. The first study of material from Komolothi showed that these are sedimentary rocks accumulated over 7 million years ago at the turn of the ages of torton and messyn. The original assumptions about their composition, which initially were assumed to be calcareous, were overturned. However, subsequent analyzes have shown that it is cemented with coarse dust and silicon-aluminum sludge (so-called mudstone). This silt is additionally characterized by an increased ability to bind to water molecules. Subjected to pressureit is compressed and dried in appearance resembles hardened and cracked clay. These conclusions explain in part why before the cement entered the modern building for good, the inhabitants of the surrounding villages extracted this material from the pyramids and used it to seal the roofs of their houses. The observatory is located at the top of the Skinakas mountain at an altitude of 1750 m. The idea for its construction was born in 1984, soon after the construction of the road leading to the mountain began. It was a joint initiative of the Cretan University, the Foundation for Research and Technology - Hellas (FORTH) and the German Max-Planck-Institut für Extraterrestrische. These organizations work together to provide students with modern education in the field of astronomy, and support astronomical observations including extended sky research and objects such as comets or nebulae. Napoleon's house is one of the few typically tourist attractions in Ierapetra. Hidden in the thicket of side streets, this building offers nothing more than the view of its modest and rather neglected facade.